Our company is specialised in the production of filtering materials and filters based on them, both for industrial use and for domestic needs. Therefore an internal laboratory has been created that studies the properties of materials, their structure, under a microscope with the magnification of 40 to 400 times. The microscope is equipped with a 9MP camera, which is connected to a personal computer at the lab technician’s workplace, where Altami Studio is installed. 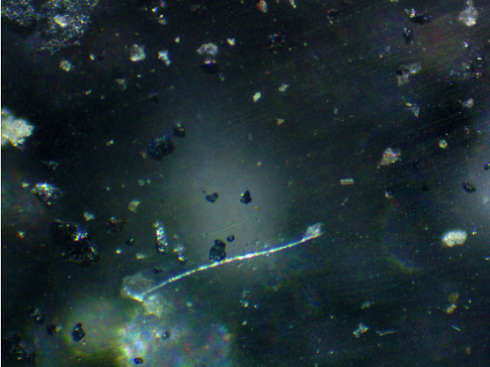 The photo shows the structure of a high-temperature filter made of glass fibers contaminated with atmospheric dust. The laboratory technician’s tasks include determination of filtrate granulometric composition (particles entrained by the filter), pollutants, shapes and fiber sections of of filter materials, and their orientation in space. In the photo you can see particles of ash, atmospheric dust and crystals of ammonium nitrate. Thanks to a variety of tools and user-friendly interface Altami Studio significantly simplified measurement intensity. Detailed study of these properties allowed our company to quickly develop its own mathematical model of filtering materials for their accurate selection and operating parameter predictions, including efficiency. Determination of measured elements distribution (particles of filtrate, pollutants or fibers in our case) enables to accurately assess their characteristics and to correct the technological process of production. In the photo you can see the filter structure made of a non-woven cloth, which is strongly clogged with crystals of ammonium nitrate and a magnesium additive. As an example, to determine filter material properties, you need to know its physical properties, such as the actual fiber diameter, its shape and distribution, pore volume and shape. The method for determining these parameters involves conducting from 100 to 300 measurements under the microscope of the actual fiber diameters. Using Altami Studio, a lab technician spends 40 to 120 minutes on the specified measurements. Without a program complex on a personal computer, the indicated measurements would take from 6 to 8 hours.